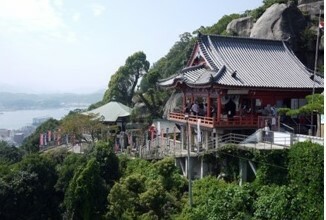 Located between Osaka and Hiroshima, Fukuyama City is a great, easily accessible vacation destination. It is also a beautiful and quaint city in its own right. While once known for its roses and castle, recently Fukuyama City is probably best known as the location for the Studio Ghibli movie, “Ponyo on the Cliff.” The town in the movie is modelled after the fishing port of Tomonoura. Tomonoura has quaint streets as well as museums that highlight the area’s history. In addition to its picturesque ocean port, Fukuyama City is also known as the “City of Roses.” Every year a rose festival is held during the month of May, and visitors can enjoy the beautiful blooms and fragrances in the city’s Rose Park. The whole town turns into a rose celebrating greenhouse. We have parties at restaurants or public areas like a park. For example, last month we had a cherry blossom viewing party. I teach usually 4-6 lessons a day some in the afternoon and some in the evening. The day starts out a little busy and then there is a slight lull in the middle of the day around 4-6pm and then it picks up again after that. There is a very consistent flow to the days so sometimes the weekend comes sooner than I can believe. It’s great to see and listen to them speak better as I continue to teach them. It’s especially great after you have taught them in various lessons because you really get to know about their opinions and personal life. It’s also great to teach students for a long time so I can build a nice rapport with them.